Alcove Spring is located 6 miles South of Marysville on the East River Road. As emigrants headed west on the Oregon Trail they crossed the Big Blue River at Independence Crossing. Many times the river was too swollen to cross, so the travelers had to wait a few days to make the crossing safer. Near the crossing, the emigrants discovered one of the most beautiful and serene sites along the Oregon Trail – Alcove Spring. The spring flows from the side of the alcove into the basin below the falls. Water from a wet-weather creek flows over a rocky outcrop and falls 10-12 feet into the same pool. Alcove Spring got its name in 1846 when the Donner-Reed Party was forced to wait for the Big Blue River to go down from May 26 to May 31. One of the members of the party, Edwin Bryant, found and named the site. “Alcove Spring” and “JFR 26 May 1846” were engraved in a rock at the top of the falls and are still visible today. Sadly on May 29th, Sarah H. Keyes, the mother-in-law of the party’s co-leader, James F. Reed, died. Over the years the original gravesite was lost, but in 1950, the Arthur Barrett Chapter of the Daughters of the American Revolution dedicated a monument at the Spring in her honor. Because of the five-day delay at the Big Blue River and poor judgment in attempting an untried route across the Great Salt Desert, the Donner-Reed Party reached the Sierra pass too late. Blocked by snow, the emigrants were stranded. Of the 81 stranded, only 45 survived. Alcove Spring is listed on the National Register of Historic Places. The site was previously on a privately-owned pasture and had been open to the public, until the 1970’s when public access was denied. In 1993, the park was reopened. A year later, the Alcove Spring Historical Trust bought 233 acres, which included Alcove Spring. 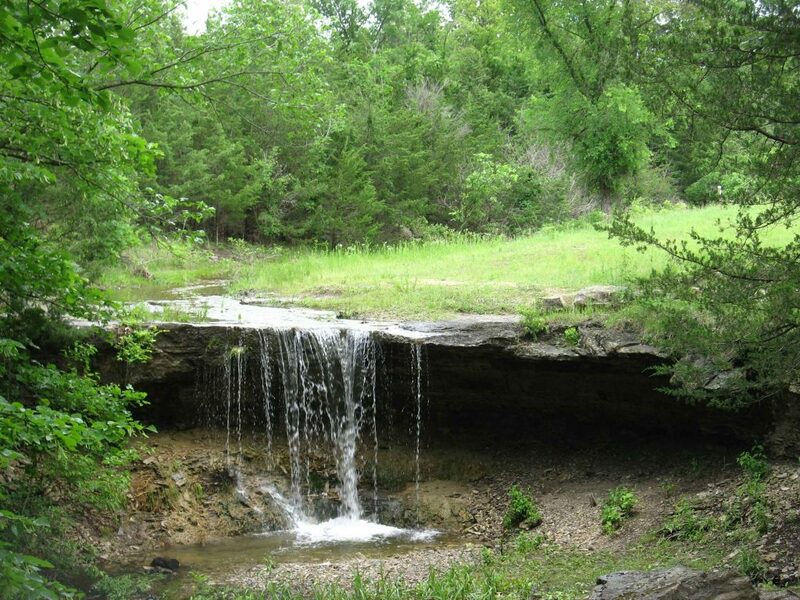 Another organization, The Alcove Spring Preservation Association, hosts events at the site and works directly with the Kansas State Historical Society and the National Park Service to preserve Alcove Spring and interpret the story of the site. The area is rich in natural beauty and features native grasses, wildflowers, trees, birds and other animal life. You can hike a short trail from the parking lot, through a shady woods to the site of the actual falls, or take a longer hike through the hills. Approximately 5 miles of marked and mowed walking trails guide you along streams, hilly trails with beautiful views of the Blue River Valley, highland pasture land that has never seen the plow and some of the prettiest vistas in Marshall County. Across the road from the parking area, you will find the Sarah Keyes monument, informative signs, Independence Crossing and wagon swales still visible today.